Along the famous RN7 tarred road from the capital Antananarivo to Tulear, Isalo Rock Lodge is the only 4 stars hotel and it is surrounded by the magnificent Isalo National Park. 1) A 3 days trip from Antananarivo, with beautiful and ever changing landscapes. It is a unique trip with 2 stops where the demanding effort is compensated by the astonishing views and the culmination is a relaxing three nights in our hotel, with stunning rocks view from the rooms and a beautiful swimming pool. Once you have visited the incredible Isalo National Park, you can proceed for three hours to Toliara by car and then by boat to Anakao Ocean Lodge or by car to Ifaty La Mira Hotel, where you will be welcomed by a beautiful sand beach and coral reef, before flying back to Antananarivo. 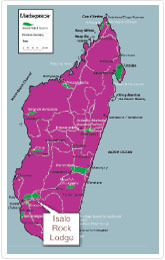 2) A daily flight from Antananarivo to Toliara (TLE). To proceed by a comfortable 4x4 vehicle to Isalo Rock Lodge with a glance to the Baobab plains. Enjoy the stay for three nights, visiting the canyons of the Isalo National Park, the natural pools, waterfall, of course chameleons, the unique Lemurs and the unbelievable endemic beautiful Pachypodium. The continuation of your journey is either by going back to Antananarivo by road, as per point 1 or going back by diving in the emerald sea of Anakao Ocean Lodge or Ifaty LaMira hotel as for the point 1 above. Arrival in the evening, welcome drink and then enjoy the room. - Visit to Isalo National Park with our picnic bag. - Return to the hotel in the late afternoon to relax before dinner. - In the morning, a guided walk of 1.5 hours in the Pachy Circuit around our hotel. This entail to see our small natural swimming pool, walking through spectacular mountains full of pachypodium and indigenous plants. - Lunch around our swimming pool and relax around it, as it wish. - At middle afternoon, visit to the nearby MNP museum. - Before sunset, step to our Giorgio's window and see a spectacular panorama and sunset up to darkness, having drink if needed. - Before dinner, a SPA massage if wanted. In the following morning, the departure, after two days unforgettable.